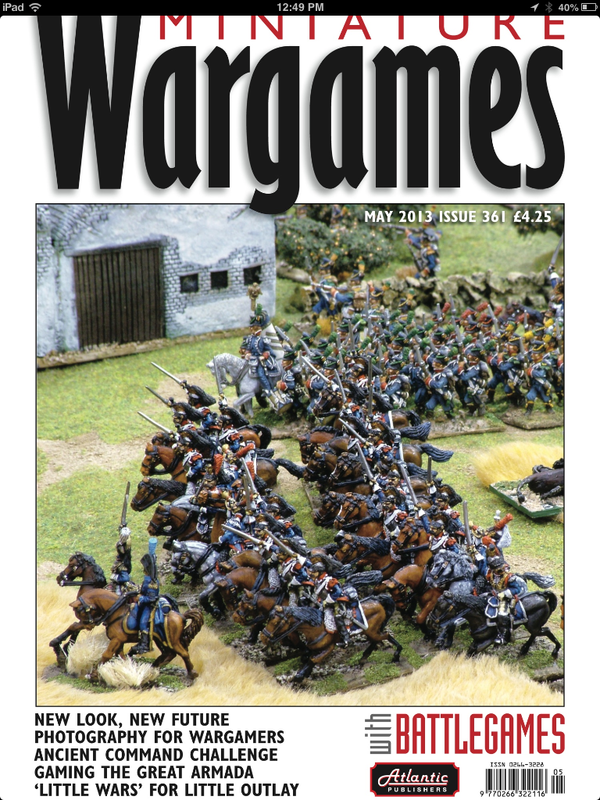 This is the latest issue and the first issue of the combined Miniature Wargames with Battlegames magazine. It is also the first one under the editorship of Henry Hyde. I have been looking forward to this as Battlegames was one of my favourite wargames magazine. The first thing apparent is the clean white screen – it really stands out quite well. I should note here that I have taken Battlegames and Miniature Wargames both as eMagazines so the copy of Miniature Wargames with Battlegames I am looking at is a digital copy. The magazine is now 80 pages long, it was 72 pages as Miniature Wargames. The content isn’t rushed either. If it takes 6 pages for the article then it is given 6 pages, there are no harsh edits that I could see. Having said that, the impression I had as I read though it for the first time was that I was looking at an expanded Battlegames with its cover in white rather than red. The article list looks like a typical Battlegames issue. The magazine though does provide a good read for the wargamer and along with Wargames, Soldier and Strategy, it is my favourite monthly wargame read. Overall, I would wholeheartedly recommend this magazine. I am not sure losing one whole magazine for 8 pages more of Miniature Wargaming is worth it. Have read through the new one (like you in digital) and I think the jury will stay in deliberation for a few more issues. it’s only Mike Siggins who puts me off. I don’t know why anyone would want to read his ‘pipe and slippers, harumph’ school of commentary these days. Pension him off with his Charles Grant scenarios and a box of flats to play against the ghost of H.G. Wells. I mean, does he actually every play anything, or have any good things to say about rule-sets that are based on mechanics more recent than 30 years ago or use anything other than 25/28mm figures? Yes, but Mike Siggins would want you to use rules that were published 30 years ago, and not commercially available, just so you can demonstrate your wargames ‘purity’. Whilst it’s true that Siggins’s last two page piece really was just a listing of the rules he likes, and whilst it is also true that he did refer to many rule sets currently in the museum, he did also mention a couple of modern sets and one set that had not been published yet. It was kind of a boring read – a catalogue of rules and I felt kind of cheated by the end – I had only kept reading in the hope that something else was going to be mentioned. I rest my case m’lud… guilty as proven I think you will find is the only possible verdict. Take up the black cap and gavel. Did you notice that on the iPad the two subscriptions were combined, so you can see when the Battlegames come out in relation to the Miniature Wargames. Also it means you have two copies downloaded? Ask him on his Facebook page.